It's been so fun seeing everyone's goals! I've been saving mine for IWSG, becasue it probably the thing I'm most insecure about. 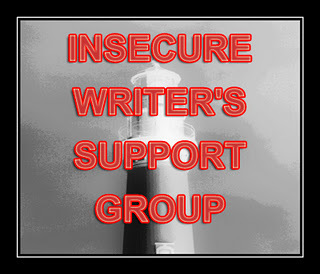 Today's IWSG is hosted, as always, by the amazing Alex J. Cavanaugh! Give him a round of applause folks. 1. Try everyday not to binge eat. This isn't just about losing weight, I seriously have an issue. I just want to eat healthy and feel good. 1. Listen to my husband/children. Because I'm scaredy cat, I often shut down and try to take myself out of the moments when my husband and kids really need me. I KNOW I'm not going to perfect at this, but I think if I strive for it daily then I'll see a marked improvement in my life. This is also my only goal for my family. If I can master this, then everything else will fall into place. 1. Write and revise three books this year. Last year I was able to write three books, but revision was another matter. Eventually, whenever I sell a book or make the decision to self publish, I want to be publishing three books a year. So this year is going to be a trial run. Honestly, I want to pee my pants thinking about it. But it's all part of the "trying new things" goal. 2. Visit ten blogs M-F. I haven't even come close to this once in the past year, and I don't think it's so crazy that I can't do it. I mean, there will be some days when it just won't happen (Christmas anyone?) but it's another one of those things that I'm just going to get up the next day and try again. 3. Don't give up. Believe it or not, this is something I know I'll struggle with too. I probably won't get an agent this year (again) I probably won't be able to figure out how to fix one of my books (again) I will probably hate writing and everything associated with it a few times in the coming year (again). So it's best to just put it out there now. One of my goals is to not give up.